MOSCOW (Sputnik) - Former US National Security Agency contractor and whistleblower Edward Snowden recalled on Thursday, following the arrest of the WikiLeaks whistleblowing website founder Julian Assange that the United Nations had ruled Assange's detention to be a violation of human rights. "Important background for journalists covering the arrest of Julian #Assange by Ecuador: the United Nations formally ruled his detention to be arbitrary, a violation of human rights. They have repeatedly issued statements calling for him to walk free — including very recently", Snowden wrote on Twitter. 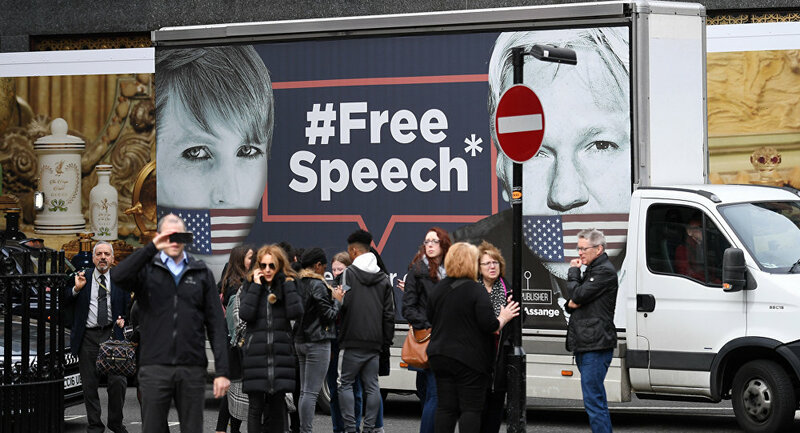 He also posted a screenshot with the Office of the UN High Commissioner for Human Rights's statement, dated 21 December 2018, demanding the United Kingdom abide by its international obligations and immediately let Assange "walk free" from the Ecuadorian Embassy in London. Earlier in the day, the UK police arrested Assange inside the Ecuadorian Embassy in London, where he had been residing since 2012 under political asylum fearing extradition. Ecuadorian President Lenin Moreno confirmed on Thursday that the country had withdrawn Assange's asylum status over his alleged violations of international conventions. Assange is currently being held in custody. His mother said on Twitter, citing his lawyer, that the activist was likely to appear before a UK magistrates' court within 24 hours.